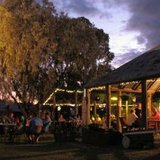 Jondaryan Woolshed is an iconic structure in Queensland's landscape, offering year round entertainment that pays tribute to our illustrious history and heritage as a farming state. Along wit the major events of the Working Draught Horse Expo, the Jackie Howe Festival of the Golden Shears, and Father's Day Shearer's Brunch - among many exciting events held at the working farm - there are also monthly dances. In line with the theme of the Woolshed, these are old time dances featuring swing and line dancing among other styles. Along with dancing to a fantastic live band, there are lucky door prizes, raffles and a game of monte carlo or two and supper is provided to keep you going. Dances go from 7:30 until midnight in the Flagstone Creek Hall with a $10 entry fee for adults and $5 for children. Upcoming dances are the 21st of July, this is also a Black and White Mask Ball and details of attire can be found on the Jondaryan website listed below. After that, August 18th, September 15th, October 20th - which sees in a special Halloween themed dance, with November 17th and a Christmas Old Time dance on December 1st seeing us into the New Year. This night of fun offers a great escape from the worries and stresses of the modern world and is a wonderful night for the whole family. Why? For an Old Time Dance! Op Shop Shoes: Should You or Shouldn't You? Caitlin, the Jondaryan Woolshed is very much an iconic structure in Queenslands landscape and history. The Jackie Howe (Singlet) is also an icon of Queensland. I say get out there and have a look.